GeneviÃšve CastrÃe has long been beloved for her mini-comics, comics, visual art, and music. There is a unique quality to all of her artistic endeavors - quiet, serene, depressing. CastrÃe's keen eye for detail and her fearless ability to probe the depths of her troubled past make Susceptible a stirring portrait of an artist coming into her own. Susceptible is the story of Goglu, a daydreamer growing up in Quebec in the '80s and '90s with a single mother. From a skillful artist comes a moving, beautiful story about families, loss, and growing up. "[Susceptible]'s pervasive melancholy is still lingering with me, a reminder of why we really read: to feel things besides our own emotions." --Paris Review "[Susceptible is] a devastating coming-of-age graphic memoir." --CBC "Castree's black-and-white, Scarryesque illustrations accompany tiny, precise cursive lettering that gives the whole work a whispered, confessional quality, as if each word were an embarrassing secret. At times, Goglu's story is overwhelmingly, heartbreakingly sad, but Castree leaves a glimmer of hope: a redemptive future shaped by art, independence, and unconditional love." --Booklist [Susceptible]'s pervasive melancholy is still lingering with me, a reminder of why we really read: to feel things besides our own emotions. Paris Review [Susceptible is] a devastating coming-of-age graphic memoir. CBC Castree's black-and-white, Scarryesque illustrations accompany tiny, precise cursive lettering that gives the whole work a whispered, confessional quality, as if each word were an embarrassing secret. At times, Goglu's story is overwhelmingly, heartbreakingly sad, but Castree leaves a glimmer of hope: a redemptive future shaped by art, independence, and unconditional love. Booklist " ["Susceptible"]'s pervasive melancholy is still lingering with me, a reminder of why we really read: to feel things besides our own emotions. "Paris Review" ["Susceptible "is] a devastating coming-of-age graphic memoir. "CBC" Castree's black-and-white, Scarryesque illustrations accompany tiny, precise cursive lettering that gives the whole work a whispered, confessional quality, as if each word were an embarrassing secret. At times, Goglu's story is overwhelmingly, heartbreakingly sad, but Castree leaves a glimmer of hope: a redemptive future shaped by art, independence, and unconditional love. "Booklist"" "["Susceptible"]'s pervasive melancholy is still lingering with me, a reminder of why we really read: to feel things besides our own emotions." --"Paris Review ""["Susceptible "is] a devastating coming-of-age graphic memoir." --CBC "Castree's black-and-white, Scarryesque illustrations accompany tiny, precise cursive lettering that gives the whole work a whispered, confessional quality, as if each word were an embarrassing secret. At times, Goglu's story is overwhelmingly, heartbreakingly sad, but Castree leaves a glimmer of hope: a redemptive future shaped by art, independence, and unconditional love." --"Booklist " Praise for Genevieve Castree's "Susceptible ""["Susceptible"]'s pervasive melancholy is still lingering with me, a reminder of why we really read: to feel things besides our own emotions." --"Paris Review ""["Susceptible "is] a devastating coming-of-age graphic memoir." --CBC "Castree's black-and-white, Scarryesque illustrations accompany tiny, precise cursive lettering that gives the whole work a whispered, confessional quality, as if each word were an embarrassing secret. At times, Goglu's story is overwhelmingly, heartbreakingly sad, but Castree leaves a glimmer of hope: a redemptive future shaped by art, independence, and unconditional love." --"Booklist " Praise for Genevieve Castree: "[Castree] offers three connected minimalist fables dreamily portraying a young woman's reactions to depression, domesticity, and motherhood in delicate watercolors that, thanks largely to her keen graphic skills, make them whimsical without being cloying." "--Booklist ""[Castree's work], illustrated in a delicately watercolored style that suggests Richard Scarry in the throes of an Edward Gorey obsession, is an episodic meditation on love, belonging, and personal identity. The visual metaphors for depression and home will break your heart; the care taken with their rendering will join the broken pieces back together on every page." "--The Austin Chronicle """We're Wolf "is composed of a trilogy of adult fables about happiness, sadness and companionship drawn in a graceful, languid style." "--Publishers Weekly"
..".an aching clarity [is] evident in [Castree's] sombre grey tones and her dexterous, serpentine lines. "-Globe & Mail Best 100 Books of 2013 "With mesmerizing honesty Castree resurrects the obscenely disorienting turning points of a childhood, the ones that haunt a person for a lifetime. After reading the last page I closed the book and wept a little bit about its simple, perfect ending." -MIRANDA JULY, author of It Chooses You and No One Belongs Here More Than You Goglu is a daydreamer with a young working mother, a disengaged stepfather, and a father who lives five thousand miles away. Drawing, punk rock, and the promise of true independence guide Goglu to adulthood while her home's daily chaos inevitably shapes her identity. 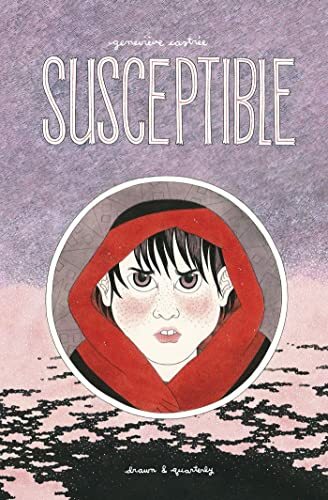 Susceptible is a devastating graphic novel debut by Genevieve Castree; it's a testament to the heartbreaking loss of innocence when a child is forced to be the adult amongst grownups..